There is no greater food to master than steak. If you can make a steak that's only marginally better than your neighborhood Applebee's, you'll still have friends waiting outside your door for steak night. And if you can make steak as good as that expensive gourmet steakhouse you went to for your birthday? Well, your popularity is about to increase dramatically. What I love about cooking steak is that it's all about precision and technique. There's nothing inherently complex about cooking a steak, and yet there's a world of difference between someone who knows exactly what they're doing with a steak, and someone who doesn't. When we think of steak cooking technique, we think of pan temperature, seasoning, doneness, etc., What we don't think about enough is what comes after the stove has been turned off: the slicing. In reality, cutting your steak properly is a huge part of cooking a steak correctly, and can make a world of difference for whomever you feed your steaks too. Here's everything you need to know about properly cutting steak. Chefs always talk about how you need to let steak rest for flavor, but you also need to let the steak rest for purposes of cutting the meat. 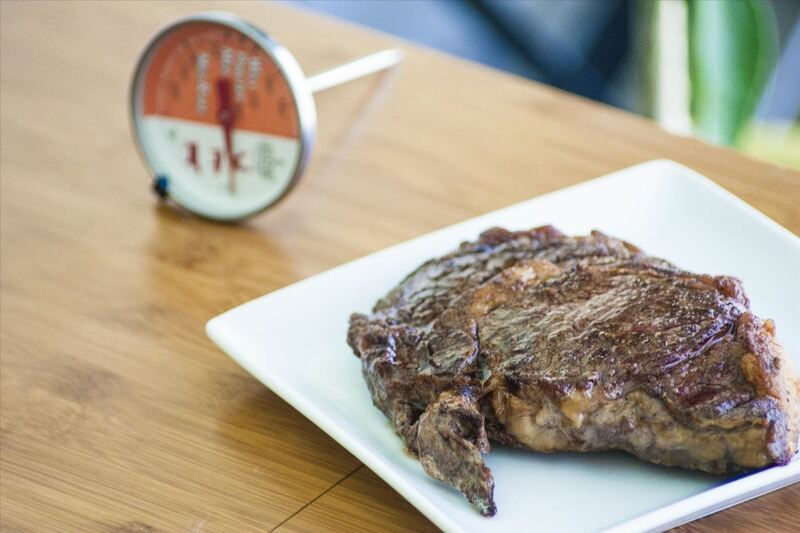 When your steak is first removed from the heat, the juices are all congregated near the surface, and the meat is both uneven and overly tender. As the beef rests, the juices redistribute, and the internal texture of the steak improves dramatically. If you try and cut your steak immediately after cooking it, it's like trying to slice an overripe plum: a mushy disaster. But if you let the meat rest for 5–10 minutes, it will be the perfect consistency for slicing. 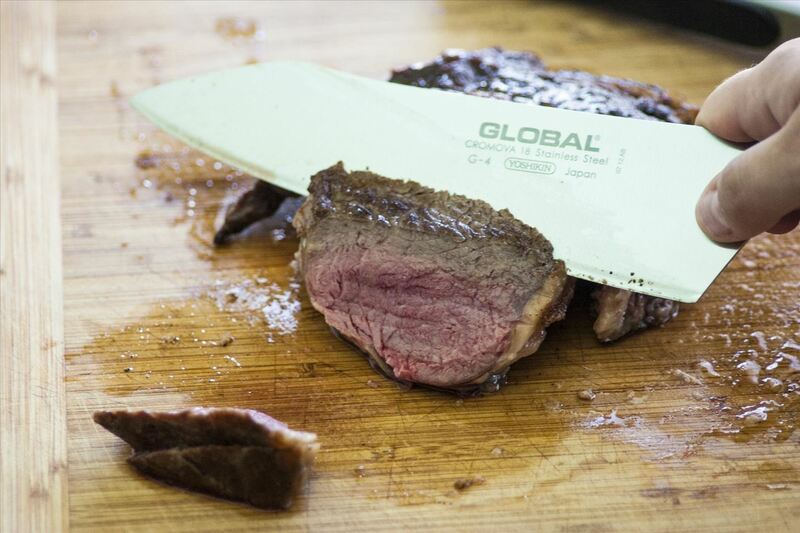 You'll want to use your chef's knife (hopefully recently sharpened) to cut your steak. 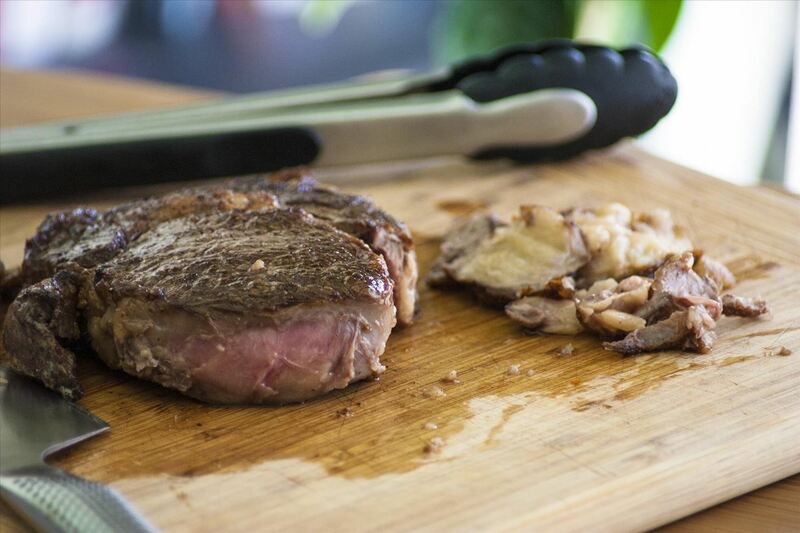 A bread knife (a common choice) will rip and shred the steak as you cut it. It's also important that you always use your tongs or a serving fork when cutting steak. Since steaks are hot and oily, they're hard to hold with your non-cutting hand, so instead use something large and stable (i.e., not a regular fork) to keep the steak in place while you cut. Beef fat, while deliciously flavorful, is not fun to eat. Unlike, say, pork fat, beef fat doesn't fully render, and it's a very unpleasant consistency to try and chew. Most people leave the fat on their steak, and work around it once the meat is on their dinner plate. Trimming the fat off of the steak before serving the meat, however, makes for a much more pleasurable eating experience. That said, you want to be sure to trim the fat after you've cooked the meat, as the fat imparts a lot of flavor into the meat during the cooking process. One of the easiest mistakes to make when cooking a steak is cutting with the grain, instead of against it. You can identify the grain in beef the same way you would in wood, by noting which direction the connective tissue is traveling. 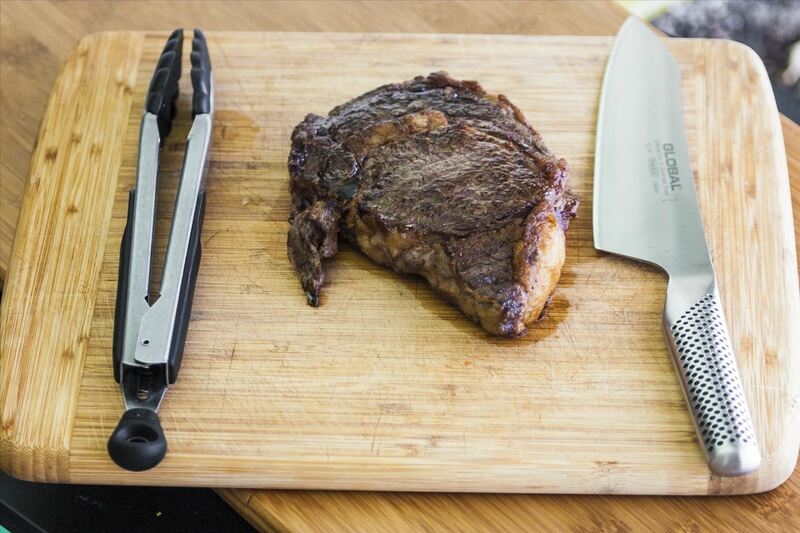 When your beef is cooked, run your knife perpendicular to the grain of the steak, or else you'll have a piece of meat that's tougher than jerky. You also want to cut at a diagonal, as this will help your steak retain most of its juices (it also looks better). Are there any steak-cutting tips that we're missing?